Not to be confused with Cichy (disambiguation). For the Czech and Slovak form, see Tichý. 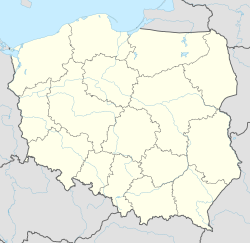 Tychy [ˈtɨxɨ] ( listen) (former German: Tichau) is a city in Silesia, Poland, approximately 20 kilometres (12 mi) south of Katowice. Situated on the southern edge of the Upper Silesian industrial district, the city borders Katowice to the north, Mikołów to the west, Bieruń to the east and Kobiór to the south. The Gostynia river, a tributary of the Vistula, flows through Tychy. Since 1999 Tychy has been located within the Silesian Voivodeship, a province consisting of 71 regional towns and cities. Tychy is also one of the founding cities of the Metropolitan Association of Upper Silesia, a pan-Silesian economic and political union formed with the eventual aim of bringing the most populous Silesian areas under a single administrative body. Tychy is well known for its brewing industry and its international developed brand Tyskie, which dates back to the 17th century. Since 1950 Tychy has grown rapidly, mainly as a result of post-war socialist planning policies enacted to disperse the population of industrial Upper Silesia. The moniker Tychy is derived from the Polish word cichy, meaning "quiet" or "still". Although appropriate for most of Tychy's history, the name is now somewhat ironic considering the growth of the city from 1950 onwards. Originally established as a small agricultural settlement on the medieval trade route between Oświęcim and Mikołów, Tychy was first documented in 1467. In 1629 the first trace of serious economic activity was recorded in the shape of the Książęcy Brewery, which is now one of the largest breweries in Poland. From 1526 onwards the area on which Tychy is built was part of the Austrian Habsburg Monarchy. This situation came to an end when Prussia forcibly took the land in 1742, before itself becoming part of the German Empire between 1871 and 1918. For a short period between 1918 and 1921 Tychy was just inside the border of the newly formed Weimar Republic and still a part of the German Province of Silesia, only securing its place within the Second Polish Republic after the armed Silesian Uprisings (1919 to 1921). Shortly after its cession to Poland, Tychy began to develop into a small urban settlement, acquiring a hospital, a fire station, a post office, a school, a swimming pool, a bowling hall and a number of shops and restaurants. Its population also grew between World War I and World War II, reaching a population of 11,000 at its highest point during this time. Along with the rest of industrial Upper Silesia Tychy was occupied by Nazi Germany forces after the invasion of Poland and absorbed into the Third Reich, while many of its inhabitants who were not expelled or exterminated were forced to change their nationality to German in order to comply with the racist policies of Nazi Germany. The city received minimal damage during the invasion because most of the nearby fighting took place in the Mikołów-Wyry area. The "New City" was designated by the Polish government in 1950 and deliberately located near to Katowice with the intention that it would not be a self-sustaining city. Tychy is the largest of the so-called "new towns" in Poland and was built from 1950 to 1985, to allow for urban expansion in the southeast of the Upper Silesian industrial region. By 2006, the population had reached 132,500. The design and planning of New Tychy was entrusted to Kazimierz Wejchert and his wife Hanna Adamczewska-Wejchert. In the administrative reforms which came into effect in 1999, Tychy was made a city with the status of a powiat (city county). Between 1999 and 2002, it was also the administrative seat of (but not part of) an entity called Tychy County (powiat tyski), which is now known as the Bieruń-Lędziny County. Tychy is twinned with the town of Milton Keynes, United Kingdom. A large Fiat car factory is located in Tychy, that was opened in 1975, and is owned by the Italian manufacturer since 1992. In 2008, the factory had a production of nearly half a million cars. It produces the new Fiat 500 and the new Lancia Ypsilon. It was the exclusive manufacturing site for the second generation Fiat Panda until 2012, when it ended production , and of the 2nd generation Ford Ka (under an OEM agreement between the two manufacturers) until May 2016. Also in Tychy is located the GM Powertrain Poland factory producing automobile engines for General Motors cars. This plant was opened by Isuzu as Isuzu Motors Polska (ISPOL) in 1996; 2002 GM took over 60% interest of that company, and in 2013 the remaining 40%. The Tyskie beer is produced in Tychy, by Kompania Piwowarska, a subsidiary of the multinational brewing company SABMiller. It is reportedly one of the best selling brands of beer in Poland, with around 18% share of the Polish market as of 2009[update]. In Tychy operates one of three remaining trolleybus systems in Poland. Tychy is home to two major sporting teams, both named GKS Tychy. GKS stands for Górniczy Klub Sportowy, (English: Miner's Sporting Club), which is a common prefix for Polish sports teams situated near mines or in mining regions. GKS Tychy ice hockey club is among the most successful in Poland and plays in its premier league, the Ekstraliga. Established in 1971, the team won the Polish Championships in 2005 and has won the Polish Cup four times. The club is housed in the newly refurbished Tychy Winter Stadium (Polish: Stadion Zimowy w Tychach), which seats 2,700 people. Several players from the club have gone on to play in the American and Canadian NHL. These include Mariusz Czerkawski and Krzysztof Oliwa. GKS Tychy football club football club was also established in 1971 and currently plays in the Polish Second League. Throughout a varied career the club reached a pinnacle between 1974 and 1977, making it into top Polish league Ekstraklasa. During those glory days GKS Tychy also participated in the 1976–77 UEFA Cup. Tychy City Stadium (Polish: Stadion Miejski w Tychach) is home to the club and seats 15,300 spectators. A few notable footballers were either born in Tychy or spent some of their career at the club, the most famous being Real Madrid and Poland goalkeeper Jerzy Dudek. Ekstraklasa player Bartosz Karwan started his career there, as did retired player Radosław Gilewicz. Bayer Leverkusen defender Lukas Sinkiewicz was born in Tychy, but now holds German nationality. Tychy will host several matches for the 2019 FIFA U-20 World Cup. Tychy is also home to several other sports teams, including basketball team Big Star Tychy, futsal team GKS Jachym Tychy and floorball team TKKF Pionier Tychy. Tychy has been the birthplace and home of notable people, both past and present. German sculptor August Kiss (1802–1865) was born in Paprotzan, Prussia, which is now situated within modern day Tychy. Most famous for his grand neoclassical works, Kiss also sculpted the fine pulpit of St. Adalbert's church in Tychy's neighbouring town of Mikołów. Augustyn Dyrda (b. 1926) is a sculptor who currently resides in the city and is best known for his socialist realist and modernist works, including several in Tychy itself. Soldier Roman Polko (b. 1962) is one son of Tychy whose achievements hold national importance today. His distinguished career has led him to the post of acting chief in Poland's Bureau of National Security. ^ Schwartz, Nelson D. (2009-07-14). "To Shrink a U.S. Car, Chrysler Goes to Poland". The New York Times. Retrieved 2009-07-14. ^ "Bardzo smutna data w historii "polskiej" motoryzacji". Motoryzacja. 2012-12-21. Retrieved 2013-07-13. ^ "GM Purchases Remaining Shares in Tychy Plant". media.opel.com (press release). 2013-04-22. Retrieved 12 February 2014. ^ "Kompania Piwowarska has managed to increase its market share significantly in spite of the industry's dip in sales". SABMiller. 1 March 2010. Archived from the original on 16 December 2012.